It’s one of those busy weekends where you end up going back to work to get some rest! First, of course, is the job search. Neverending at the moment. Nothing major to report. Secondly, at the Portland SFWA Reading, I got asked to hurry up and write a story for an anthology that closes like, um, within a week. By yesterday I’d managed to get around 1500 words on a story that needed to be at least 5000, with a story line that wasn’t quite sure of itself. Thirdly, we had ballet tickets for Friday night. Fourthly, Saturday was a good clam tide. Fifthly, we plan to go skiing on Sunday. And oh yeah, I need to finish a frackin’ short story this weekend. 1.) Not applied for any jobs but will work on that tomorrow between writing periods. 2.) I put in 2500 words today. I am a Writing Studette. Since we were going clam digging this morning, I transferred files onto the laptop last night and charged it. On the way to our friend’s house in Clatskanie, I wrote–something like 1300-some words, Portland to Clatskanie. Got to friend’s house, put laptop on charger, went clam digging. Came back, between writing and deleting, wrote about 1700 words. End count today: 4059 words. A bunch of those words are utter dreck, but the problem is that my story arc can resolve in one of two ways, and I need to write about 3000 more words to figure out which arc is the strongest, then cut/recraft to fit. Just gotta get it done by Wednesday. And, oh yeah, go skiing, work at the Day Jobbe…and maybe ride horse. Horse could get dropped on Monday, since it’s the day before farrier that wouldn’t be bad. I might just get her the fiveway vaccination and do that on Monday. Then there’s the AC repair…and a lot of other stuff. Nonetheless, the story will get done. I’m dredging up old 4-H Fair memories, mixing them with my memories of Fair as a leader, and then tossing in a healthy dose of hippie music festivals and Country Fair. Loving it so far…even the pieces that are dreck. It’s a story that needs to be overwritten, then pruned into shape. Friday night’s ballet was okay. I find contemporary work either to be very good, evocative, and inspirational…or totally meh. I liked two of the works, the third was meh. We went razor clamming near the South Jetty of the Columbia River near Hammond. I’ve never dug razor clams before, so it was a bit of a learning curve–but between the three of us, we dug 2 1/3 limits. I was impressed with the size of the clams and the relative ease in getting them–my last clams got dug up on the way back to our friend’s truck. Plus we ended up driving on the beach to get to the good clamming space–would have been quite a hike with buckets and all for us. Lots of clams, lots of big clams–we could have probably limited out, but we got tired.The clams weren’t showing signs very clearly, so I dug a lot of false holes. Even though a clam gun ( cylinder about 2 1/2-4 inches in diameter, capped at one end with several different possible handle types) is easier than a shovel, at least for this razor clam novice, it gets tiring after a while. 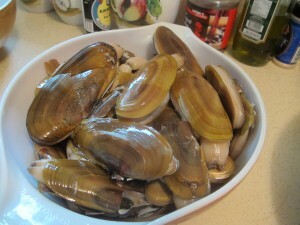 But I still managed to dig a respectable number of clams! So anyway, I’ve uploaded today’s writing. Depending on the weather, I’ll go skiing tomorrow–and then shoot for another 2500-3000 words. Maybe start editing tomorrow night, maybe leave it for Monday. Looking good right now, though.